HUMBOLDT, Kan. (July 13, 2018) – If Jonathan Cornell’s last lap pass on Thursday wasn’t exciting enough, the driver of the Starline Brass No. 28 cranked it up to 10 then ripped the knob off; winning by inches over Mike Goodman at Humboldt Speedway on Friday night. A co-sanctioned event with the American Bank of Oklahoma ASCS Red River Region presented by Smiley’s Racing Products and NCRA, Jonathan picked up $2,000 for the victory. Coming from the ninth starting spot, Cornell dashed through the field with restarts playing well to the No. 28. Led from the onset by Mike Goodman, the race’s final restart with four laps to go put Cornell at his back bumper. Able to work away by several car lengths Goodman maneuvered the hub of the Humboldt Speedway with ease. Racing to the final lap, however, Cornell hunted the line; closing the gap on the No. 11g as the pair raced off the second turn. Entering turn three just off Goodman’s right rear, Jonathan kept his momentum to pull even for the lead off the fourth turn. A drag race to the finish, the multi-time ASCS Warrior Region Champion earned the win by 0.026 seconds. His second podium finish of the weekend, Alex Sewell charged from 15th to third. Following the No. 8 through the field, Jeremy Campbell was the highest finishing NCRA Driver in fourth with Don Droud, Jr. making up the top-five. Casey Wills, Chance Morton, Zach Chappell, Fred Mattox, and J.R. Topper rounded out the top-ten. 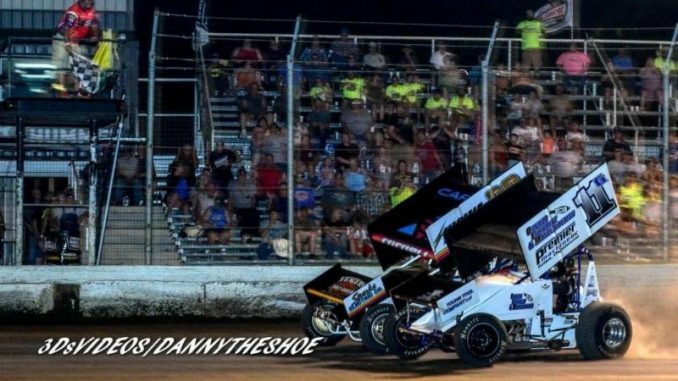 Round 3 on the weekend will see the ASCS Red River/NCRA Shootout move to 81-Speedway in Park City, Kan. on Saturday, July 14. Gates open at 5:00 P.M. with racing at 7:00 P.M. (CDT). More information, directions, and prices can be found online at http://www.race81speedway.com. Humboldt Speedway – Humboldt, Kan.